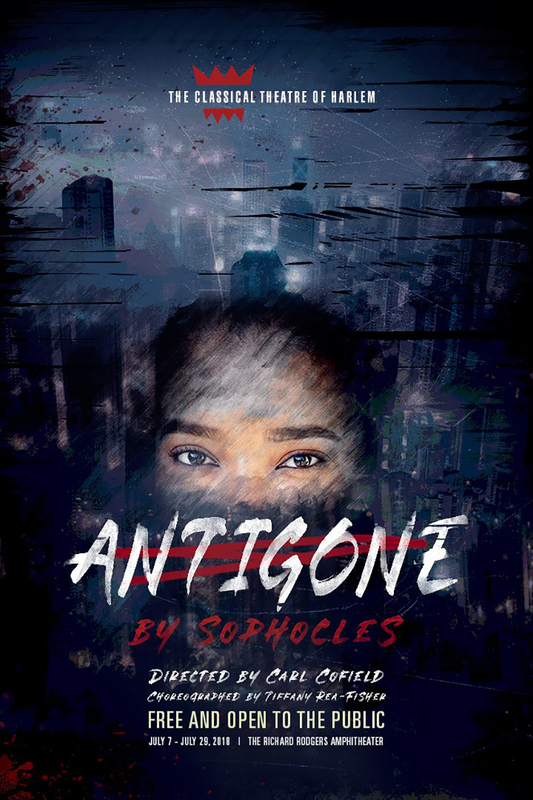 The Classical Theatre of Harlem will grace the stage of The Richard Rodgers Amphitheater in Marcus Garvey Park with the opening of Antigone by Sophocles, directed by Carl Cofield. Antigone, inspired by the Paul Roche adaptation of the classic Greek tragedy by Sophocles, will kick-off The Classical Theatre of Harlem’s sixth season. The company of Antigone includes: Obie Award winner Ty Jones (as Creon; POWER, Julius Caesar), Kahlil X. Daniel (as Teiresias), Carl Louis(as Haemon), Ava McCoy (as Ismene), Adaku Okpi (as Eurydice) and Toya Turner (as Antigone). The ensemble features Ryan Alvarado, Samantha Barriento, Denzel Fields, Daniela Funicello, Avon Haughton, Brynlie Helmich, Anthony V. Merchant, JoVonna Parks, Nedra Snipes and Thomas Varvaro. “Our Antigone is inspired by a counter-culture movement known as Afropunk, which will be juxtaposed with the themes of tradition and order. The current political climate is ripe for this story. Women across the world are finding their voices and confronting powerful men, institutions and organizations. This timely ancient text is still clearly relevant today,” said Carl Cofield, Director of Antigone. “Though we call our summer season ‘Uptown’ Shakespeare in the Park,’ we took a detour this summer to present Antigone for one simple reason – greek plays are unafraid to question everything we value – including life. Antigone is a story where the people, who assert they are right, clash with a system, whose leaders have the same assertion. After 2500 years, ‘Antigone’ still asks of us – are we all players on an odyssey to find our shared humanity or are we in a perpetual state of ideological warfare that will always end in inhumane violence?” – Ty Jones, Producing Artistic Director of The Classical Theatre of Harlem. Antigone by The Classical Theatre of Harlem will open on July 7th and run to July 29th at the Richard Rodgers Amphitheater in Marcus Garvey Park from Tuesday – Sunday beginning at 8:30pm, enter the park on Fifth Avenue and 124th Street. Free and open to the public. The play will run for 85 minutes, without intermission. 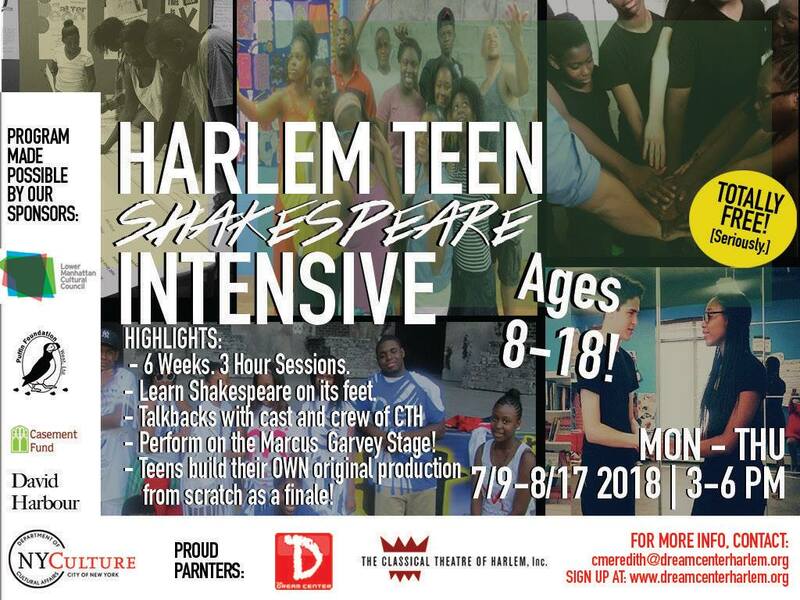 In Addition, check out Harlem Teen Shakespeare Intensive! What else is happening in Marcus Garvey Park? Check the Marcus Garvey Park Alliance website and Facebook Page, and The Public Art Initiative (8 new art installations arrived in June + the installation ‘Atlas‘ on view to October). Sing for Hope Piano is back in Marcus Garvey Park, set near the three Little Free Libraries along the 124th Street side between Mount Morris Park West and Madison Avenue. If it’s Saturday, the Marcus Garvey Park Farmers Market can be found at 124th Street and Mount Morris Park West. Previous Previous post: June 16th ~ A Night of Jazz & Swing!